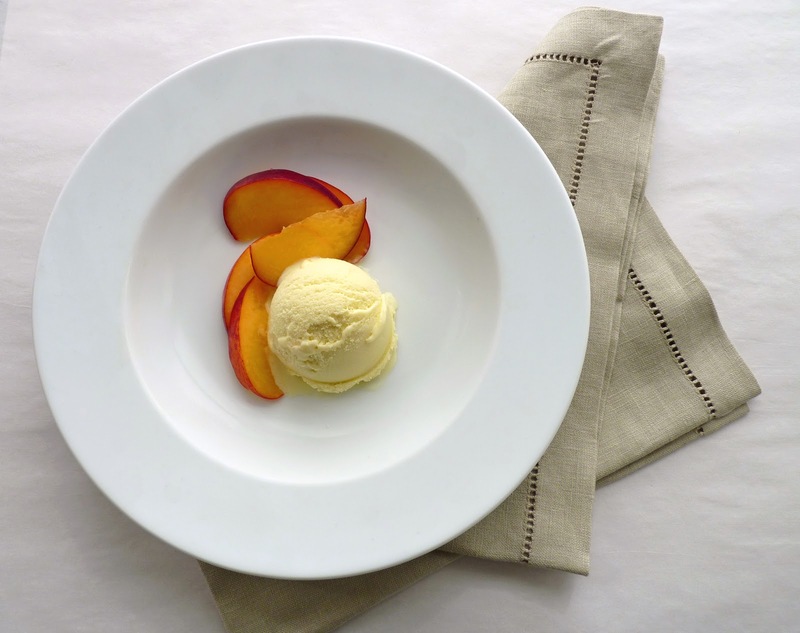 Out of the sunny climes of our best agricultural regions come the last of the season’s sunset blush of apricots. I know I wax poetic about apricots every year. They are my favorite fruit, so I can’t help myself. And when it comes to dreaming up pastries and desserts, I tend to want them to be centered on the pure taste and sensation of apricot loveliness in full measure. 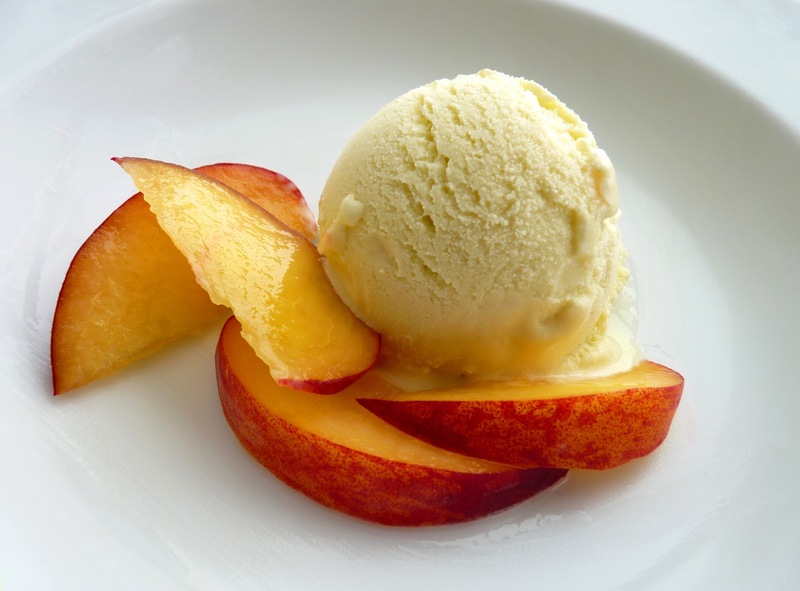 Apricot Ice Cream surely rises to the occasion. 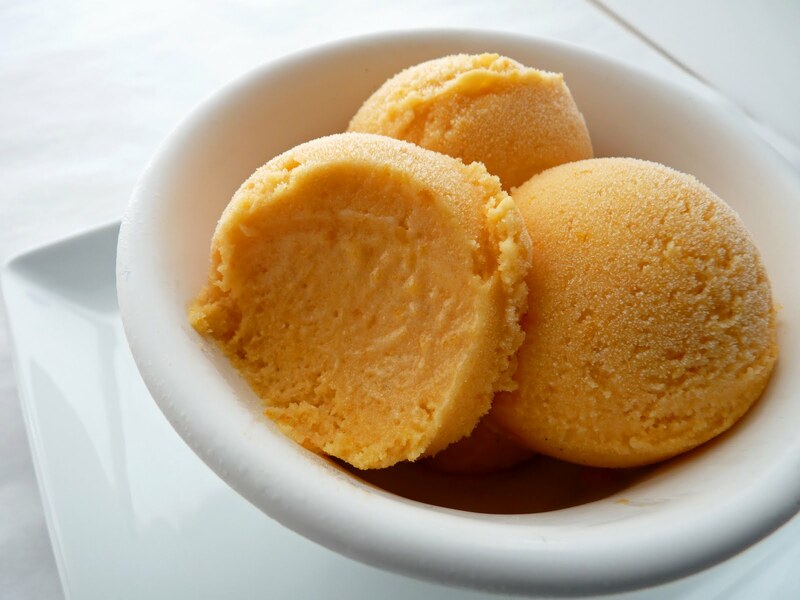 This ice cream comes from a treasure trove of trusted recipes found in The Perfect Scoop by David Lebovitz. It has a big bite of pure apricot pleasure complete with the full bore experience of tartness we come to expect from this pucker worthy fruit. It’s rich and luxurious without being too heavy. Perfect for a summer afternoon. Apricot season always arrives in a short burst. If you want to get in on the bounty before another year passes, time to rush to your ice cream machine and dive in. 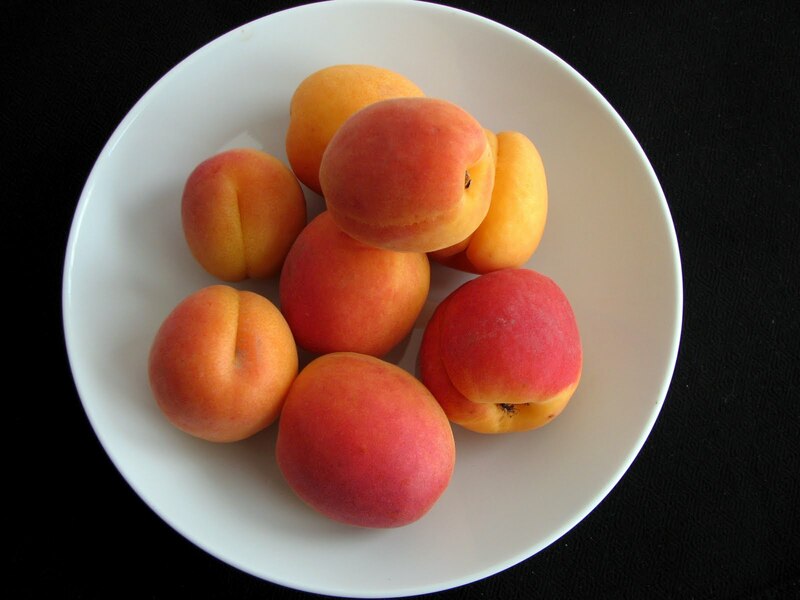 - For the best flavor, choose apricots that are soft and very ripe. - Strain the apricot puree if you want to remove any trace of fiber. 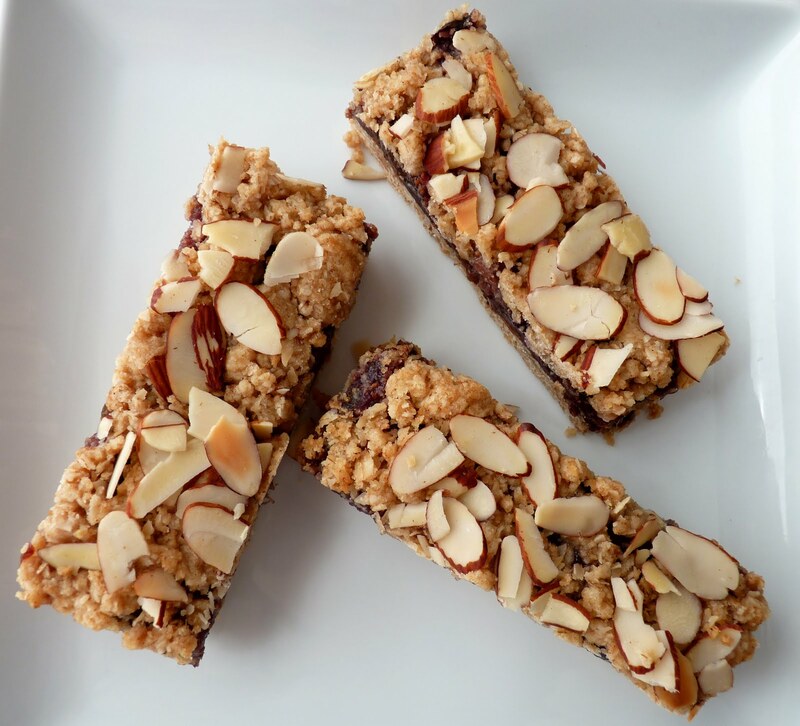 - Be extra careful when adding almond extract to the mix. A little bit goes a long way. Glancing at my calendar, I realize that in one month I will have completed four incredible years in this pastry studio. As I experiment in my lab week after week after week, it seems I almost always find myself keeping things simple and fresh. I have my days when the ideas I have or the recipes I’m testing don’t quite measure up, but for the most part, the process of discovery of what works and what doesn’t is one that is enjoyable in and of itself. When the contents of your toolbox consist of the aroma of flour, the luxury of butter, the constant mystery of chocolate and the bright spring palette of luscious fresh fruit in a region brimming with it, it’s hard to mistake your good fortune. It’s a supreme pleasure to be able to keep my hands in it. 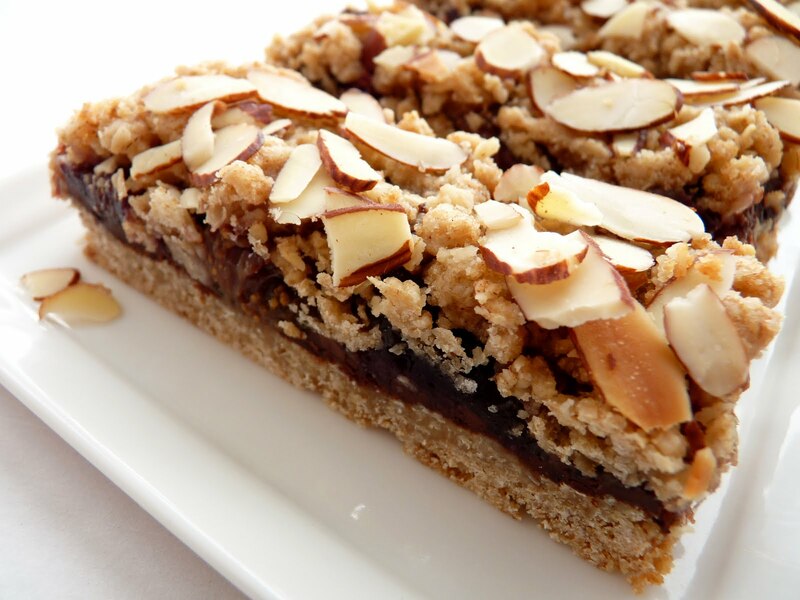 This particular pastry gathers the wonderful worlds of oatmeal, fresh figs and decadent dark chocolate into one welcome cookie universe. It’s a comforting collision of great flavors. It comes in the form of a bar cookie that makes it very easy to prepare and even easier to entice. I also like the chewiness that bar cookies invariably deliver. It’s hard to argue with something so simple. Since oatmeal is one of my obsessions, I decided to use it as the base for everything else. 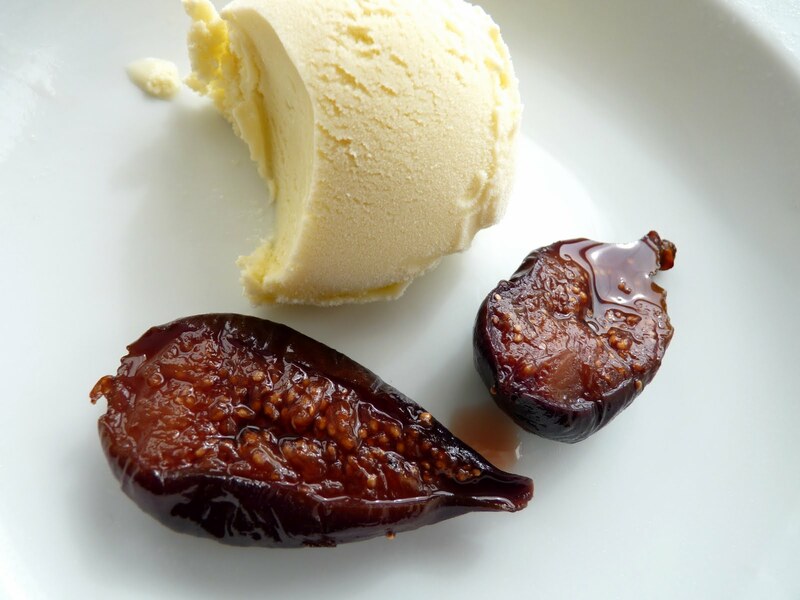 Fresh figs cooked on the stove for just a few minutes bring out their jammy goodness, add moisture and unmistakable figgy flavor. A layer of chocolate is included just to gild the lily, which is sometimes necessary when pursuing these things. - Use old-fashioned oats, not the “quick” variety. - If you want the figs to dominate, use 3 oz of chocolate. For a more pronounced chocolate layer, use 4 oz. - Vary the fig jam by adding lemon or orange zest or vanilla bean or crushed anise seeds or a punch of port. 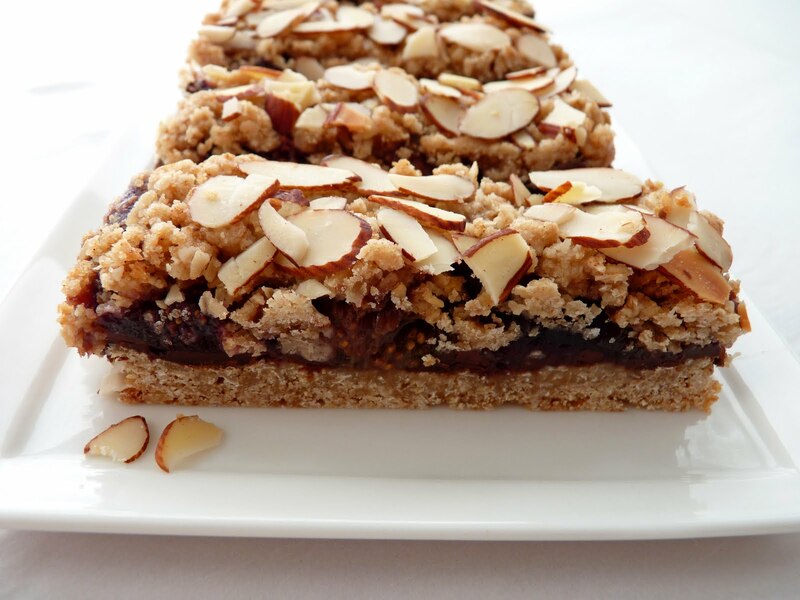 - For an even grander supreme experience, add a handful of raspberries after the figs are cooked. - I think it would also probably work nicely to substitute whole wheat flour for the all-purpose flour. 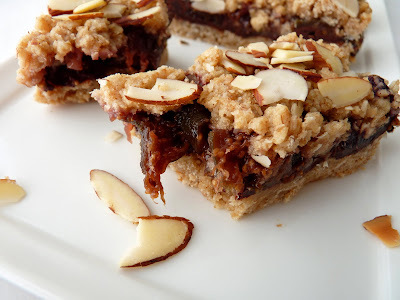 - More fig cookie goodness: Whole Wheat Fig Raspberry Bars, Fig & Goat Cheese Chocolate Sandwich Cookies and Blue Cheese Cookies with Fresh Fig Jam . Stem and chop the figs and place in a saucepan with the water and sugar. 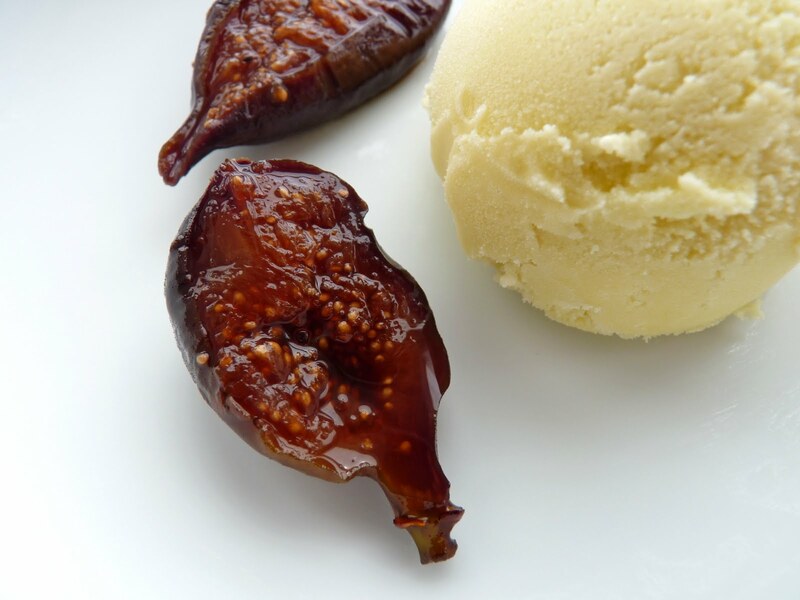 Cook on low heat until the figs are soft and juicy, stirring to prevent scorching. Add a bit more water if necessary as the mixture cooks and taste to adjust sugar. Pull off the heat and cool completely. Lightly grease an 8” square pan and line with a piece of parchment paper large enough to form an overhang along two sides of the pan. Combine the flour, oats, baking powder, salt, cinnamon and both sugars in the bowl of a food processor. Process until ingredients are combined and the oats are chopped a bit but not ground completely. Cut the cold butter into small pieces and add to the dry ingredients along with the vanilla. Pulse until the mixture starts to clump. It should remain a bit loose but hold together when pinched. Press about 2/3 of the oatmeal mixture into the prepared pan to form the bottom layer. Distribute the chopped chocolate evenly across the surface. Pour the fig mixture over the chocolate and spread gently. Top with the remaining oatmeal mixture. Press the sliced almonds gently into the surface. Bake for 25-30 minutes or until slightly browned. Place the pan on a wire rack to cool completely. Gently lift out of the pan using the parchment overhang and cut into bars. Within the luscious chocolate landscape of Pierre Hermé’s Chocolate Desserts cookbook, you will find a glamorous parade of cakes, tarts, creams, drinks and cookies. As you roam each section full of gorgeous wall-to-wall chocolate creations, you can imagine the taste and texture of every bite because everything is so beautifully and lovingly photographed, an exquisite gift from photographer Jean-Louis Bloch-Laine. Calling all cookie lovers! Even Hermé’s cookies have an incredible allure. Chocolate Sparklers are very buttery, very crumbly, flavored with Dutched cocoa and circled with bling. These cookies are essentially very dressed up butter cookies. 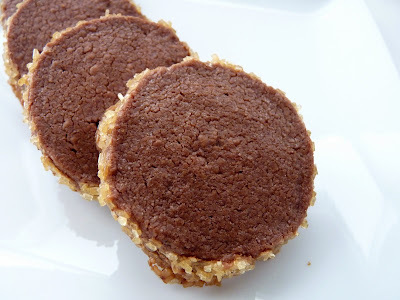 They are simple but unusually delicious all the same because once you roll the cookie dough in raw sugar you get a cookie that bakes off with very crunchy caramelized edges, providing a very nice contrast and sparkle. 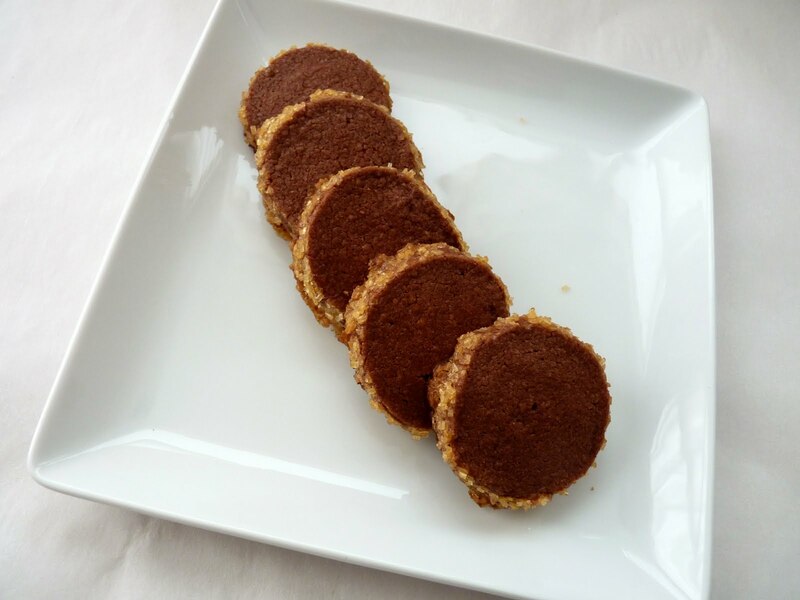 Very easy to make and even easier to eat, this is certainly a recipe to add to your cookie repertoire when the mood for a great chocolate cookie strikes. Don't delay! - Hermé calls for Dutched cocoa, which will give you a more refined, deeply rich cocoa flavor in this application. 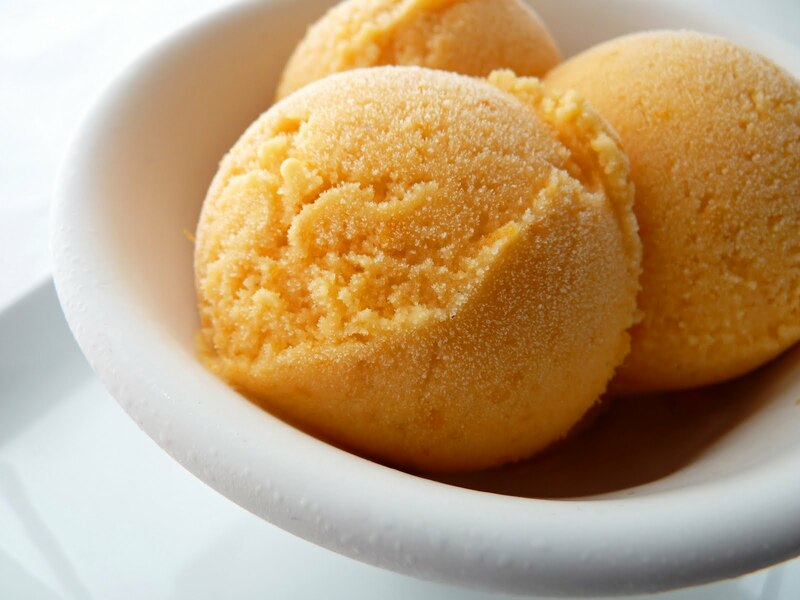 - Hermé uses regular granulated sugar but I really prefer raw sugar, a large granule sugar with a light brown color that adds great texture and flavor. Sugar in the Raw and C&H Washed Raw are a couple of brands you’re likely to find at your market. It's also a central ingredient in Braker's famous cookies, Pain d'Amande. - I sort of overdid it with the raw sugar! I was giving these away to people who especially love that collar of crunchy snap. - Do not overmix in order to ensure the cookies have their characteristic crumbly texture. - Baked cookies can be stored in an airtight container (tins are best) at room temperature for 3 to 5 days. 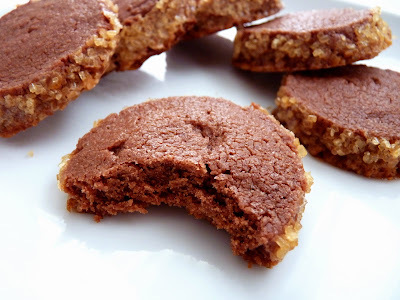 - Another really terrific chocolate cookie from the same book is Herme’s Viennese Chocolate Sablés. Preheat the oven to 350 degrees. Line two baking sheets with parchment paper or silpats. Whisk the egg yolk with one teaspoon of water. Place a piece of parchment or wax paper on a work surface. Spread out a good handful of raw sugar on it. Working with one cookie log at a time, unwrap and brush lightly with egg wash. 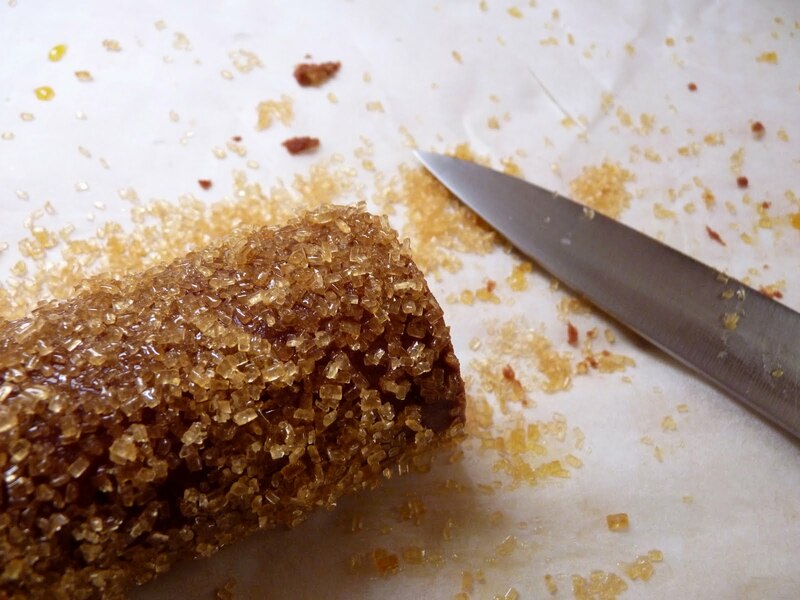 Roll each log in the sugar, pressing gently. On a recent respite at the home of some dear friends up in the beautiful rambling hills overlooking Berkeley, I had the wonderful experience of roaming a yard full of gorgeous roses, fruit trees, grape vines and lots and lots of beautiful plants. Along the edge of the garden I discovered some lovely lemon verbena. Oh, what a find! If you have lemon verbena in your midst, just pick a leaf, bend it in your fingers and you are suddenly immersed in a wonderful lemony scent reminiscent of lemongrass along with the slight sensation of the coolness of mint. It’s a very soothing aroma. And since I love Lemon Verbena Ice Cream, I was in heaven. 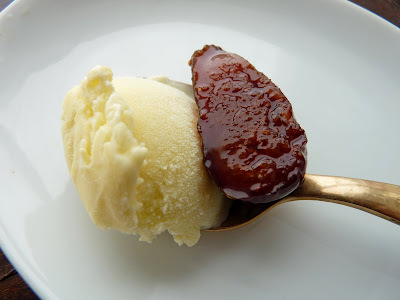 Among all the fabulous herbal ice cream preparations, this is a very subtle and unmistakably delicious one that is very unique. If you aren’t lucky enough to have friends growing lemon verbena, you may be able to find it at your local farmer’s market right about now. I also had the great fortune of tasting my first peach of the season and it was absolutely glorious. 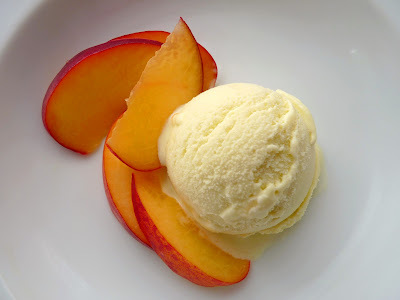 I pair the ice cream here with a few slices because I think the peaches echo the slightly floral aspect of the ice cream. It all makes for a really cool and decidedly delicious summer sensation. - As the lemon verbena leaves are steeping, taste to see if the mixture has the right strength. I steeped mine for 1 hour. I also returned the leaves to the finished custard and refrigerated the ice cream base overnight. I strained out the leaves again just before placing in my ice cream machine. - You can substitute 3 cups of half-and-half for the dairy in this recipe. 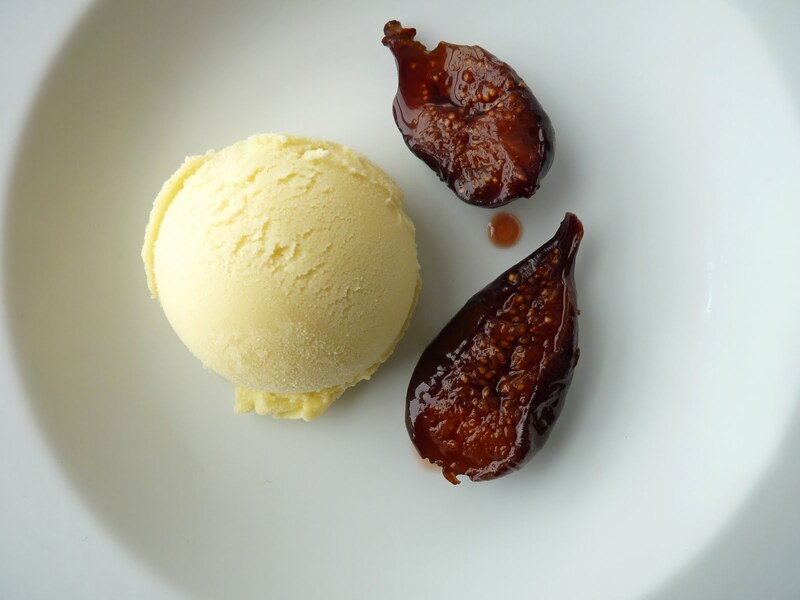 - When making the crème anglaise base for egg yolk custard ice cream, watch it closely and keep the heat on medium or medium low. Do not let the mixture boil or you will have a mess of goopy scrambled eggs. If you have an instant read thermometer, this would be a good time to use it. I tend to cook it to about 165 degrees, pull it off and keep stirring. Residual heat will usually take it to 170, which is about right. I then pour it immediately into a clean container. Just be sure to watch it very, very closely as it cooks because once it nears the right temperature of 170 - 175 degrees it continues to rise very quickly. It's trashed at 180. Like all things in pastry, lots of practice makes it easy. Remove the lemon verbena leaves from the stalk. Place the milk, cream, sugar and salt in a saucepan on medium low heat, stirring to dissolve. When it begins to simmer, add the lemon verbena leaves and continue on a very low simmer for another minute. Remove from heat, cover and steep for about an hour. 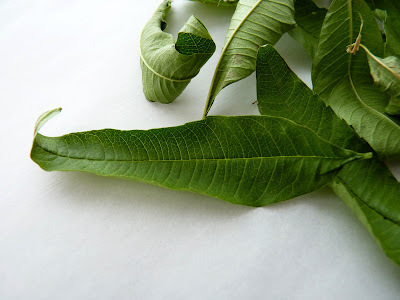 Strain out the lemon verbena from the cream mixture, pressing against the leaves to extract as much liquid as possible. Warm the infused cream. Whisk the egg yolks in a bowl and slowly add the warm cream, whisking constantly. Pour the mixture back into the saucepan and cook on medium low heat, stirring continuously with a heatproof spatula and scraping the bottom of the pan. Cook until the custard leaves a clear track on the spatula when you drag your finger across it. Immediately pour the custard into a clean container and stir to cool it down. Taste for salt and add another pinch if necessary. Cool completely and then chill the custard base thoroughly, preferably overnight.